A time-honored tradition of the New Year is to create a resolution with the hope of improving oneself. Apparently, the Butler women’s basketball team’s resolution was to not lose. Ever. After getting off to a rough 0-6 start, the Bulldogs closed the 2014 calendar year at 4-9. Since then, Butler has rattled off six consecutive victories in the Big East conference, climbed above .500 for the first time all season and now sits just a half-game back of first-place in the conference standings. The team that has put together this impressive stretch of play looks very different from the one fans saw early in the season. In fact, only two of the five players who started for the Bulldogs in their home-opener in mid-November (guards Blaire Langlois and Sydney Buck) are starting now. The addition of Ijeoma Uchendu from an injury, Loryn Goodwin from a suspension and Belle Obert after the completion of volleyball season has allowed players such as Andriana Moore to fall back into more natural roles off the bench. Goodwin and Obert have been instrumental for the Bulldogs as of late, Godlevske said. Goodwin is the leading scorer (PPG) for the Bulldogs, good for sixth in the Big East conference in scoring. 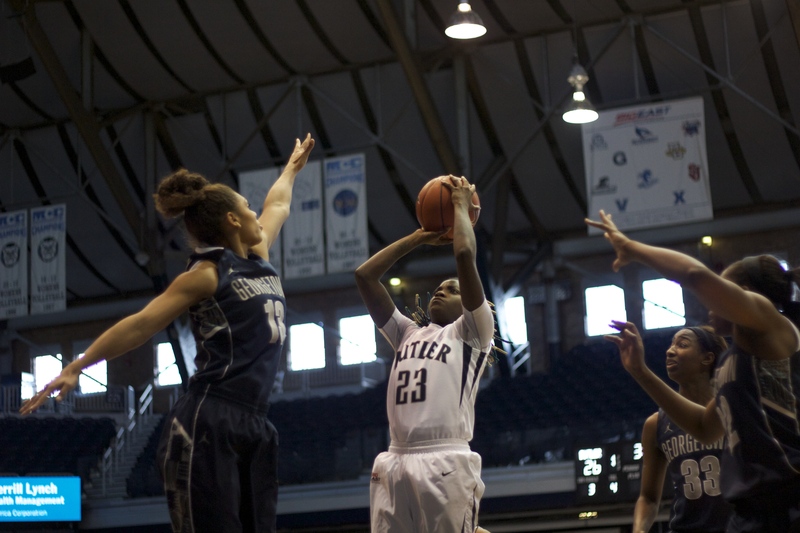 She is also Butler’s per game leader in minutes, assists and steals. Obert, a senior, joined the team after completing her final season as a star on the volleyball team. Not having played competitively since high school, she has stepped in and been a major contributor for the Bulldogs. Obert is currently leading the Big East in blocks per game (BPG). Both players echoed Godlevske’s sentiment in regards to the team’s recent success. “We’ve really been working hard in practice and coming together,” Goodwin said. Picked to finish dead-last in the preseason coaches’ poll, the run has come as a surprise to some. But beginning with a Jan. 2 win at Hinkle Fieldhouse over Providence College, Butler has looked like a team who expected to be competing at the top of the conference all along. The Bulldogs are off until Sunday when they will travel to Cincinnati to play rival Xavier University. The game will be nationally televised on Fox Sports 1 at 2:30 p.m.
Xavier comes into the game with a 12-7 record and 4-4 in the conference The Musketeers have a 9-2 record at the Cintas Center this season. The Musketeers are two games behind the Bulldogs in the Big East standings. Both teams are making unexpected noise this season, as the Musketeers were picked to finish ninth in the Big East Preseason Poll. The Bulldogs have beaten the Musketeers in three straight, including a season sweep in both schools’ inaugural seasons in the Big East Conference. Sophomore guard Raeshaun Gaffney and junior forward Briana Glover each lead the Musketeers with 10.9 points per game. Sunday’s game will be the first of a three-game road trip for Butler before visiting Providence and Creighton.